With 2017 still young, I encourage you to do a year plan. It has been one of the best ways to take a step back and see the big picture of where I am and what God is doing in my life. A few years ago, my wife and I began a new tradition, the year plan. It was a very basic exercise on blank a sheet paper. We wrote down seven key areas of our lives, and listed a few individual and collective goals that were most important to us for each area. We included a range of goals, from small things like trying new recipes, to big things like the desire to grow our family and reading the bible every day. As the year progressed, it was a way to remember the bigger priorities that we overlooked in our day to day lives. As we looked back at the end of the year, we were reminded of just how greatly God had blessed us, and of the things that were yet not part of his plan. When we began planning for the following year, we used it as a guide to see where we were being called and what we would focus in the next season. Remember that this isn’t a rule book, but a guide. We had big things come up in a year hat we hadn’t even considered, like moving houses, and we had other things on the list for a few years that we really longed for, but didn’t happen right away. 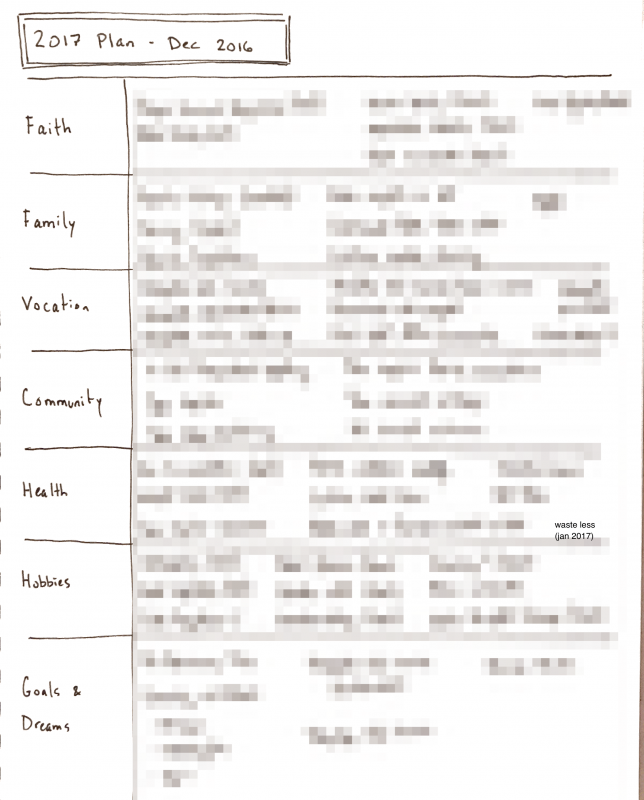 To get the most out of this exercise, I encourage you to pray about it before starting, to be realistic about the number of goals per category, and most importantly, to review it periodically throughout the year, checking in with how things are going and refocusing your time and energy as necessary. Below is a link to the template that we use, but feel free to modify it to best suit you and the season of life you are currently in.